How has Middleburn’s RS7 stood up to the abuse? Cranks. Pedals one end, bottom bracket the other, 1 – 3 chainrings, make the bike go. There’s a lot of talk about how stiff various cranks are. These ones are stiff, although it’s rare for even cheap ones to feel flexy. 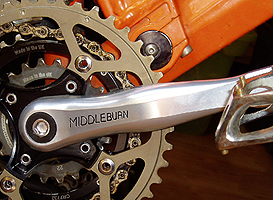 The Middleburn RS7 crankset is also on the light side. They’re made out of quality alloy in the UK. They’re a little bit pricey, with a RRP for the arms & a spider around £150 but you often see them for a fair but less than the RRP. They do have a lifetime guarantee which includes DH & dirt jumping. It doesn’t cover the splines but it’s rare that they would go on any crank in use. I would guess the disclaimer there is to avoid paying out for dodgy fitting. If you want even lighter still, the RS8’s still have a lifetime guarantee but not for DH & jumping. I can’t think of anything bad. They’re available in square taper & ISIS. Stop, I hear you say, but aren’t ISIS BB’s the worst product ever invented? Well they seem to have a bad rep, but in my experience if you get a quality BB, (not necessarily the most expensive), they last as long as the old square tapered ones. The axles are larger diameter & therefore stronger. The FSA Platinum I 1st used lasted 16 months of hard use before any play developed. It was replaced by a Superstar a couple of months ago, the design of which makes total sense, so I’m expecting that to do well. As a comparison, the best I’ve had from an external type BB is 6 months, the worst is 3 rides! Before anyone asks, yes the BB shell was faced. There are better units available now, however, from Hope, Chris King & others. Although these have a triple, the spider is removable & you can fit a lightweight XC double where the inner ring is also the spider for the big ring. Uno setups do away with a spider, the ring fits where the spider would normally. Spiders are available in XC & DH versions, and trials set-ups are also available. In the more standard config, you can get various 4 or 5 bolt types including one for XTR cranks to allow you to run your own choice of rings. Lastly, a word about chain rings. The pic shows Middleburn’s own fitted to my set of RS7’s. I use these because they seem to last better than most. It’s very hard to decide on a longest lasting make of chain ring, because the conditions & the weather make it a bit variable, but these seem to do the job. The granny ring has been on other cranksets, so it’s 2 years old or more, The big ring isn’t showing any signs of wear & it’s about 6 months old & the middle ring (gets the most use) is still going after a good few months, but has some wear. Not enough yet to need replacing, but enough that you can see it. The one on there at the mo is a hardcoat, unlike the older one in the pic. To sum up, buy a set of RS7’s if you don’t mind shelling out a bit of cash for something that will last. They’re due to release an external set sometime soon, so you may want to wait for that – I’d say there’s no need, this one is fine. Another UK product that works & works well. This entry was posted in Cranks & Chainsets, MTB components, UK designed, UK manufactured and tagged All Mountain, chainset, crankset, high end components, Middleburn, mountain biking, mtb, RS7, UK designed, UK manufactured on March 3, 2010 by steve.